Now don’t get me wrong, I have nothing against a nice warm swim at 20 degrees in the summer, nothing at all. But on Thursday Michelle got into the marine lake before 7 in the morning, I got out at nearly midday. In the middle of the morning, we were in the lake at the same time for about 20 minutes, doing laps. All I see of some of my swimming friends at the moment is a passing splash and a flash of goggles, and yet in the winter we huddle in the pub over hot chocolate and spend longer talking than we do swimming. I am enjoying the warmth, I am not complaining, but we are ships that pass at mid-morning. The winter has its good points too. 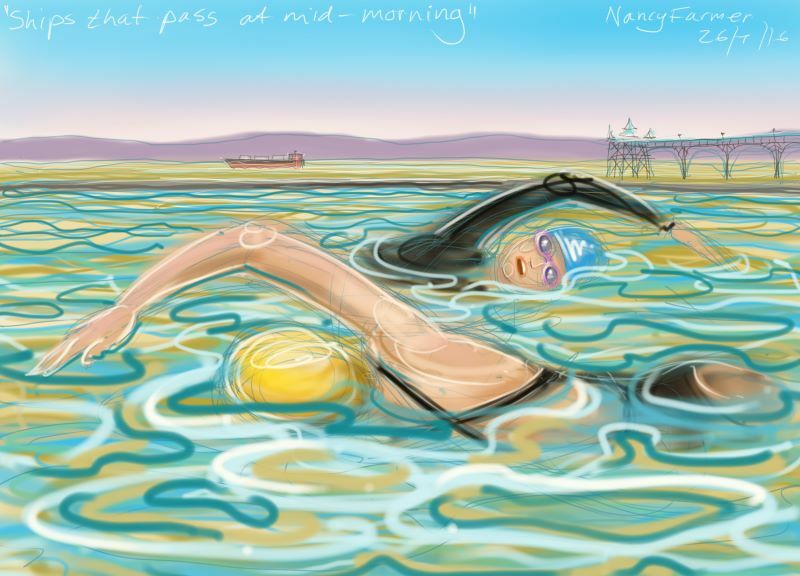 This entry was posted in swimming and tagged art, Cevedon, Clevedon Marine Lake, North Somerset, open water swimming, swimming on July 26, 2016 by Nancy Farmer.